This is a new car Bluetooth hands-free 3.5mm AUX stereo audio receiver, which has many functions, such ashands-free, FM tansmitter ,can work as charger and receives audio signal by Bluetooth. it can easily and simply to upgrade your car stereo audio and receive the audio signal of your Smartphone, iPad, iPod and other Bluetooth - enabled mobile devices. Moreover, this item is attached with a USB port which can charges mobile devices such as, cell phones, Tablet, MP3/4, etc and it also includes a 3.5mm audio cable which can transfer the audio signal from general devices (without Bluetooth function) to car stereo. 1:As a FM tansmitter :If your car doesn't have the aux port you can use your car's radio station and connect the bluetooth to your phone to play your bluetooth device's music in your car. you can star to enjoy the music and save the trouble of tunning the channel. Hands-free Calling. you won't miss any call when listen to music. 4 Modes Supported -- AUX play/Bluetooth A2DP play/TF card play/U flash disk play, Includes MP3/WMA/WAV/FLAC format, extremely high-performance built-in microphone which can offer your clear talking and wonderful music. 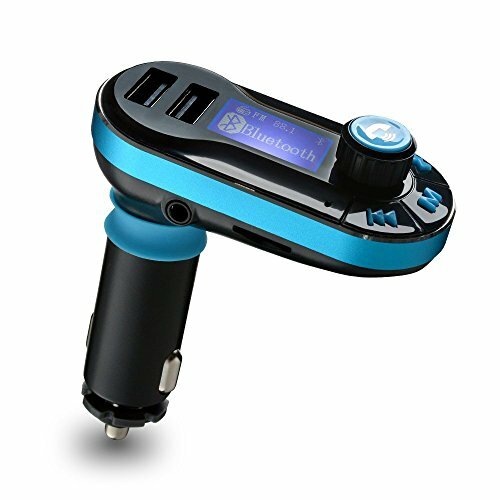 Noise cancellation by CVC, wind noise suppression in this Bluetooth FM Transmitter. AUX In and Out: Supports AUX output and input, Also supports full frequency point to launch. Car Charger: Dual USB ports charger in this can charge additional device simultaneously, this extra USB can quick charge your device with up to 2.1A high current. Widely Compatibility -- Perfect for any Bluetooth enable Smartphone - Apple iPhone 7/7Plus/6S/6S Plus, Samsung Galaxy S7 Edge/S7, Google Nexus, Blackberry, Tablets, other media players, and more! Every item you ordered from AGPtek can enjoy 45 days money back and 1 year Warranty. If you have any questions or problems, don't hesitate to contact us!